Here it is, folks. 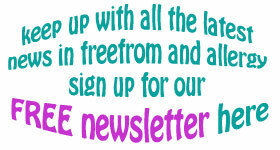 Skins Matter’s annual round-up of the best in free from skincare sets and gifts for those who love natural cosmetics. Naturally, all ranges are free from petrochemicals, SLS / SLES, parabens and many other of the ingredients you would normally only associate with high street or conventional skincare. Adam and Eve Skincare has gift sets for both males and females this Christmas, starting at £26 for a face wash and moisturiser. Products contain botanical ingredients and essential oils, and are free from fragrance, lanolin, gluten and all types of nuts. Angela Langford Skincare has a range of natural skincare gifts, including balms, face creams, face oils and serums – as well as natural skincare gift sets, including Spice Of Life Gift Set (£38) – containing a natural body butter, body scrub and body wash. With lemongrass, ginger, lime and black pepper, Spice Of Life Gift set is free from nuts, soya, lanolin, gluten, and vegetarian too. All Natural Soap Co’s range of gifts start at £2.75, and include a new, handmade Castile Heart Soap Set is suitable for those with extra sensitive skin. Their multi award-winining range is vegetarian and mostly vegan; and is also free from palm oil, gluten, wheat, soya, peanuts and sesame. Beeutiful’s Gift Box (£20) contains Foot Balm, Honey Soap, B-balm and Lip Balm presented in a corrugated gift box tied with their very own Beeutiful ribbon. Suitable for the most sensitive skin, and made from all natural ingredients, including beeswax and honey from their own bees, all products are vegetarian, not tested on animals and free from nuts, soy, sesame, gluten, alcohol and lanolin. 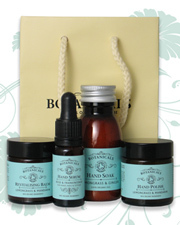 Beyond Organic Skincare have several gift packs, including an Organic Limited Edition Gift Pack (£30). All products are free from all synthetic chemicals, alcohol and lanolin, and suitable for vegans. Ingredients include sea buckthorn, rose and eyebright. Blue Labelle Skincare is offering gift sets starting at £12. All products are 100% natural and registered by the Vegan Society, and feature plant oils such as argan and raspberry seed; all gift sets contain at least one nut oil (almond) and essential oils, but no alcohol or synthetics. There are three gift sets from the 100% organic 'Biologique' range: Nourish, Balance and Rejuvenate. All come in custom-made limited edition cosmetic bags made from repurposed fabrics – either retired bouncy castles or deck chairs from a local beach. Botanicals Natural Organic Skincare, FreeFrom Skincare Awards-winning Best Free From Brand for 2014, has six gift collections (£20-35). Each gift includes trial sizes of some of Botanicals best-selling products, all of which use botanical ingredients, such as rose, camellia, mandarin and chamomile. They are all Soil Association certified, free from gluten, soya, lanolin, and are vegan too. Conscious Skincare’s gift-wrapped options start at £14.99 and include luxury organic body sets in sweet orange and frangipani or grapefruit, lemon and cedarwood fragrances, a mini spa set, or organic mini body trio. Most of the range can be presented in a complimentary eco-manilla recycled gift tube or box, finished with festive ribbon. Free from alcohol, soya, and lanolin. The majority of products are vegan. Elixirs of Life have a wide range of Christmas gifts starting at £12.99 all presented in Natural Eco Friendly Jute gift bags, from multi-award winning Gardeners Hand Care set, Men’s Care Set to luxurious face care including Mature Skin Elixir Cream containing rose, palma rosa and Frankincense pure essential oils. All products are free from lanolin, synthetic fragrances, alcohol (ethyl alcohol, ethanol), artificial colour. Eve of St. Agnes offer gift sets suitable for those with sensitive skin, one of which includes their Free From Skincare Award winning Body Cream. Prices start at £25. All products infused with a blend of essential oils, such as grapefruit, rose geranium, neroli and bergamot. All products are free from synthetic chemicals, lanolin and alcohol. Suitable for vegetarians. Green People have three new limited edition gift packs starting at £10 with natural and organic ingredients: Lemongrass & Ginger Body Lotion & Body Wash Pack (left), Bath & Shower Stocking Filler Gift Pack with Shower Pouf, and Organic Homme Gentlemen’s Classic Cleave Shave Kit. Free from ethanol alcohol, lanolin, gluten and soya. Inlight Organic Skincare are offering a limited edition Christmas Bijou Collection of organic skincare, starting at £20. There are four sets which also include award winning face masks and firm and tone oil. Free from water, alcohol, artificial fragrances, lanolin, gluten, and soya. Vegan friendly. Inner-Soul Organics’ limited edition Nordic Luxe Deep Moisture Gift Box (£45.50) contains a trio of natural and organic skincare products for bath and body. Contains the Omega 3 and 6-rich Scandinavian Decadence Shower Serum, (30ml), plus Free From Skincare Award-shortlisted, detoxifying Bath and Body Salt Scrub (100g), and our brand new nourishing Nordic Berry Bliss Hand and Body Salve (250ml) enriched with certified organic Scandinavian blueberry, raspberry and Arctic cranberry. Vegan. Kinvara Skincare are offering a number of Limited Edition gift sets this Christmas suitable for all skin types. Choose from six gift combinations, many of which include the Free From Skincare Award Winning Absolute Cleansing Oil. The range is free from soya, lanolin, gluten, wheat, alcohol (ethyl alcohol, ethanol), synthetic fragrances and is vegan. 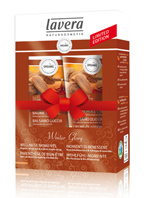 Lavera’s Winter Glory limited edition gift set (£13.90, above right) includes a natural and organic rich Shower Cream and Body Balm with maple syrup and brazil nut. Free from lanolin, synthetic fragrances, perfumes. Certified vegan. 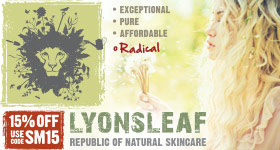 Lyonsleaf’s skincare gift sets start at £14.99. The Calendula Gift Set is suitable for those with eczema or psoriasis, and the Complete Skincare Set contains a multi-purpose facial Beauty Balm (Cleanse, Hydrate & Nourish), Body Butter, Natural Soap, flannel and instructions for the oil cleansing method. All sets are free from artificial chemicals. Butters and creams contain nut oils. Soap contains goats’ milk and Manuka honey, but vegan calendula soap is available on request. Mel Millis Phytonutri Skincare has released two limited edition gift boxes for Christmas. The Phytonutri Daily Discovery Gift Box (£88.95) includes four products for a basic cleansing routine and includes a complimentary Frankincense & Myrrh Revitalising Body Oil worth £48. The Phytonutri Qi Skincare Essentials Gift Box (£220) contains all four products from the range along with a complimentary porcelain mixing vessel designed by ceramicist Emma Clegg. Both sets are alcohol, gluten, dairy and wheat free; the Phytonutri Daily Discovery Gift Box is also suitable for vegans. Nom Nom’s award winning Organic Baby Mini Set (£22) contains Soil Association-certified Baby Bath Aloe Vera and Orange Blossom, Baby Butter Calendula and Evening Primrose and Baby Oil with Starflower for Massage and Cradle cap, all delivered in a handmade, organic cotton drawstring bag (£22). Unfragranced, vegan and free from tree nut, olive, sesame and peanut oils. A pregnancy gift set is also available. Odylique have a new limited edition Selection Box (£27), a beauty gift set with seven trial sizes of their most popular products. Packaged in a black box with orange ribbon, and with exclusive new sizes, this gift set includes two Free From Skincare Awards gold medallists. 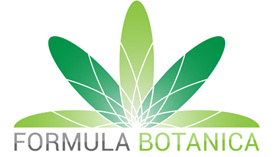 Products are: Creamy Coconut Cleanser 30ml; Calming Rose Super Tonic 4ml; Timeless Rose Moisturiser 15ml; Superfruit Concentrate 2ml; Coconut Candy Scrub 20g; Gentle Herb Shampoo 20ml; Ultra Rich Balm 20g. Products are certified to Soil Association organic standards, and are free from tree nut oils, wheat, dairy, soy, lanolin, salicylic acid, sorbates, benzoates, palm oil and artificial additives. Pure Lakes Skincare are offering selections of their best selling products packed in neat jute bags including a Gardener’s Gift Bag (£17) containing their Free From Skincare Award Bronze-winning Gardener’s Skin Repair Bar, Grapefruit & Lemongrass Hand Wash (free from detergents) and a natural bristle brush. Free from peanuts, sesame, gluten, diary, soya, lanolin and alcohol. The Rose Tree’s Christmas range of organic luxury skincare gifts includes the award winning Facial Essence with Rose & Marula in Christmas Cracker packaging and a range of gift-wrapped organic bath and body oils. A gift boxed collection of The Rose Tree’s bestsellers are available in a ‘Try Me’ size. Prices start from £6.50. Products are free from soya, lanolin and alcohol. Ruby Red Cosmetics’ gift set options this year include their award winning Revive and Gentle Body Cleanser and Revive and Repair Body Moisturiser in 100ml mini sizes. These Body and Bath Sets (£28) are also available in the Soothe and Nourish range with aroma of jasmine and cardamon. Free from synthetic fragrance and colourings. Ruth Romano have handmade and natural gift sets including a Luxury Soap Bar, an Indulgent Dead Sea Bath Soak and a Nourishing Lip Balm, in both lemongrass, and lavender (£14.99). Each product is free from synthetic chemicals, palm oil and is suitable for vegetarians. Tropic Skincare have a selection of gifts, including the Walk on the Beach collection (£24), which contains a polishing foot pebble and repairing foot cream infused with eucalyptus, fresh mint, aspen bark extract and apricot kernel oil that buffs and soothes tired aching feet. This collection is vegan and free from alcohol, lanolin, gluten, unsustainable palm oils and synthetic fragrances. which cleanse the skin with a creamy lather from organic oils. Free from artificial additives or fragrance, they are scented with pure essential oils. 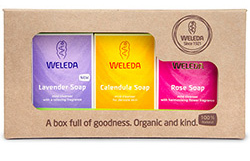 All three soaps – relaxing lavender, uplifting rose, and soothing calendula – are NATRUE certified organic and made from vegetable glycerin, organic olive oil and precious plant extracts. They are free from nuts, sesame, gluten, and lanolin. Suitable for vegans. 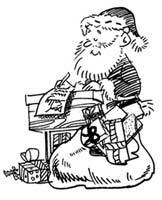 NB Information on this site is not a substitute for medical advice and no liability can be assumed for its use.